A beautiful art nouveau red walnut double bed. The bed dates from circa 1900, and has a decoratively carved headboard and footboard. It is fitted with robust side irons which supports one of our newly made pine bed bases which is supplied with this bed. All that is required is a standard double mattress. This art nouveau walnut double bed is made from red walnut, which is a traditional timber for this period. 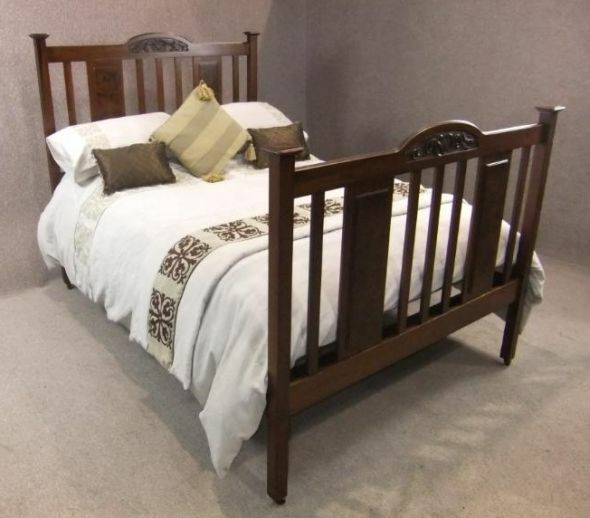 This bed is ideal as a single piece on its own, or to match up with existing furniture in any period setting.